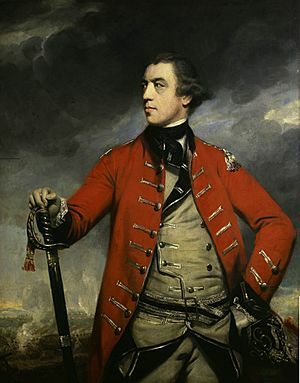 John Burgoyne is best known for his role in the American Revolutionary War. He designed an invasion scheme and was appointed to command a force moving south from Canada to split away New England and end the rebellion. Burgoyne advanced from Canada but his slow movement allowed the Americans to concentrate their forces. Instead of coming to his aid according to the overall plan, the British Army in New York City moved south to capture Philadelphia. Surrounded, Burgoyne fought two small battles near Saratoga to break out. Trapped by superior American forces, with no relief in sight, Burgoyne surrendered his entire army of 6,200 men on 17 October 1777. His surrender, was a great turning point of the war, because it won for Americans the foreign assistance which was the last element needed for victory and to be the turning point for the American Revolutionary War. He and his officers returned to England; the enlisted men became prisoners of war. Burgoyne came under sharp criticism when he returned to London, and never held another active command. John Burgoyne Facts for Kids. Kiddle Encyclopedia.